The motorcycle’s cam controls when the intake and exhaust valves open. When you’re reassembling your engine, it’s very important that you reinstall and align your camshaft properly. In the best case scenario, a misaligned cam will result in a poorly running or non-running engine. In the worst case scenario, a misaligned cam will result in bent valves and broken pistons. Before you take apart your engine, be sure to read the shop manual and take notes and pictures of how the camshaft is installed and aligned. To do so, turn your engine to Top Dead Center (TDC) for cylinder 1. Check that the marks on the camshaft, cam chain sprocket, and cylinder head are aligned properly and match what’s in the shop manual. If your motorcycle engine has aftermarket parts or modifications, the timing marks and alignment may be different than what’s in the shop manual. Take notes and make your own timing marks if necessary. However, if the engine doesn’t run right after it has already been disassembled by a previous owner, it’s possible that they installed the cam incorrectly. Set the engine to TDC. Remove the cam chain tensioner. Slide the camshaft through the cam chain. Align the timing marks on the cam with the sprocket and cylinder head. Reset the cam chain tensioner. Confirm the cam marks are properly aligned. For double overhead cam engines, make sure to count the number of cam chain links between each cam shaft sprocket. There is a specific number of links that should be between the two camshafts. Ensure both sprockets line up with the correct engine markings. 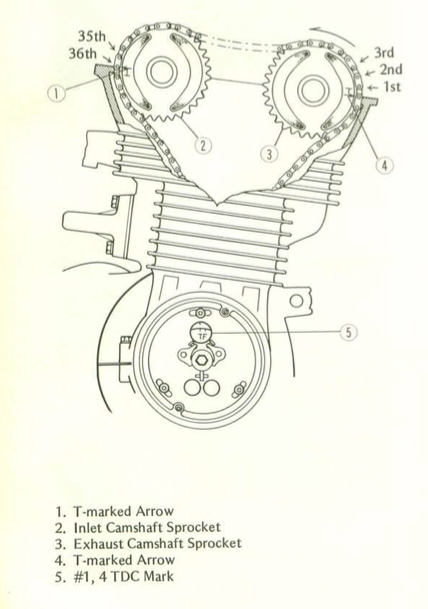 Refer to your motorcycle shop manual for the specific cam alignment instructions. When rebuilding the engine and servicing the top end, it’s a good idea to replace the cam chain with a new one. Cam chains will typically be endless or come with a master link. If you have an endless cam chain, you’ll need to split your cases to install it. As you reassemble the engine, keep something tied around the cam chain so you don’t lose it down the cam chain shaft. When you are ready to slip it over the camshaft make sure that it is properly engaged in the gear teeth on the crankshaft below. The last step in installing and timing your cam is to set the cam chain adjustment. Your motorcycle will either have a manual or automatic cam chain adjuster that bolts onto the cylinder block. Install the cam chain adjuster in its loosest position and bolt it onto the cylinder block. Set the adjustment by loosening and retightening the bolt and lock nut. Refer to your shop manual for the specific procedure. If your engine has a lot of noise, it could be due to a worn cam chain. You may be able to reset the cam chain adjuster to take the excess slack out, if not, you should replace the cam chain as soon as possible.